Remember back in the day when your Facebook and Twitter feeds were comprised mostly of text messages? No memes, GIFs or any other social media graphics to speak of. A lot has changed since then. Users' insatiable appetite for visual content grew and many social media channels graduated to rich-media platforms. 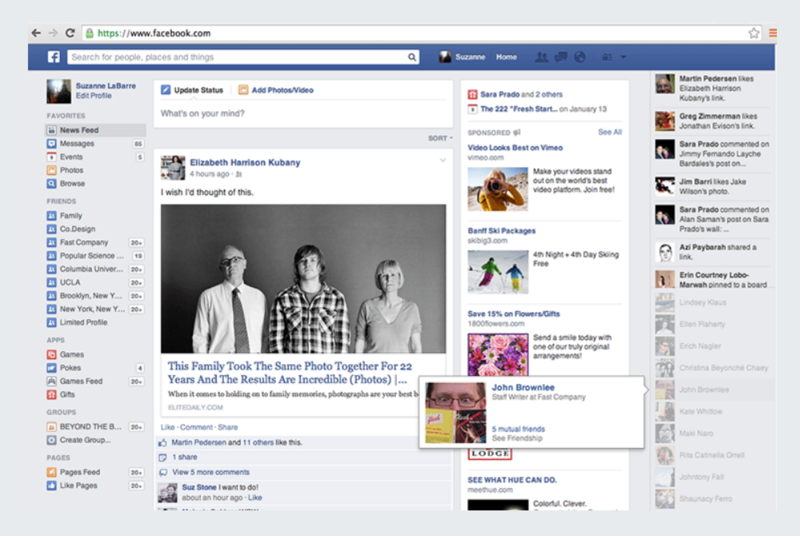 Besides larger images, Facebook's News Feed now features real-time video posts and a new 360-degree photo feature. 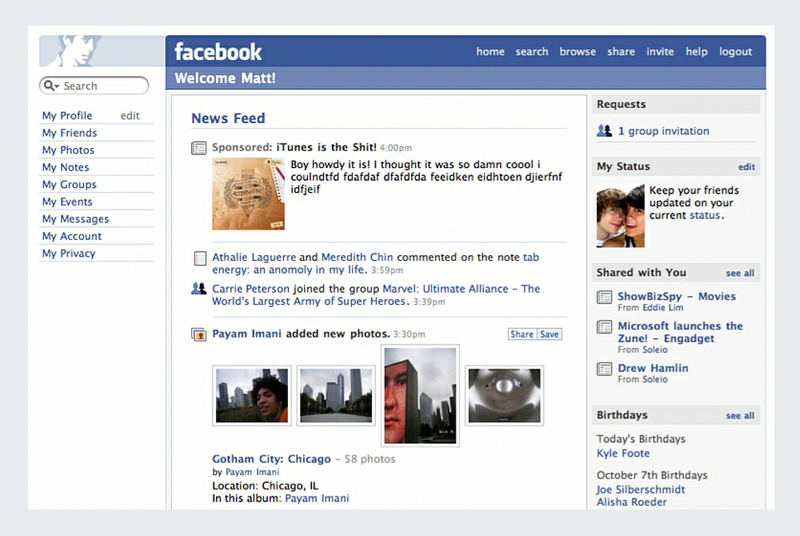 In 2010, other image-based platforms such as Pinterest and Instagram came to life and "The Visual Internet" was born. Visual IQ is increasing faster than all other types of IQs. SAT reading scores are at a record low. 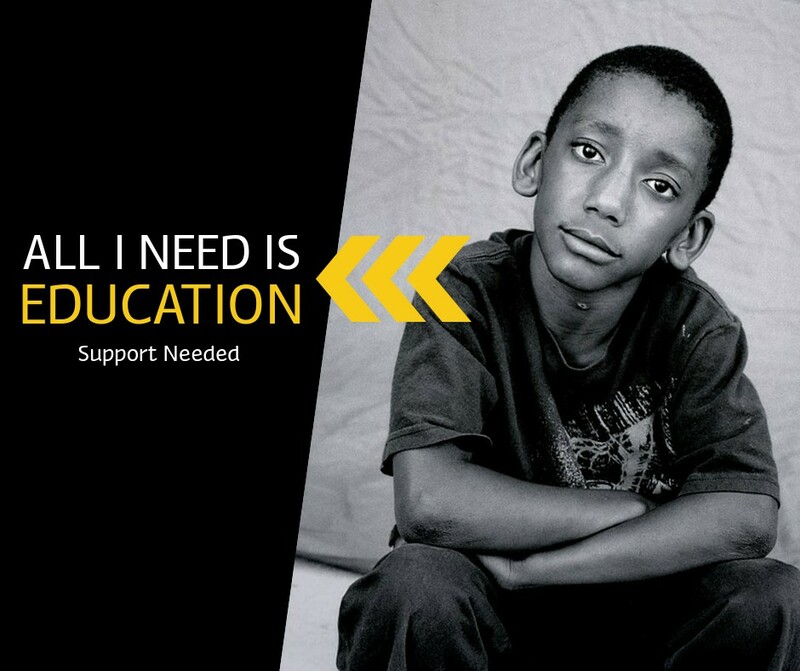 81% of educated people report to skim, rather than read, content online. 84% of online communication will be visual by 2018, according to WebDAM. What this means for content creators is that the ability to communicate visually has never been more important than it is now. This is why Visme is on a mission to simplify visual content creation for non-designers. 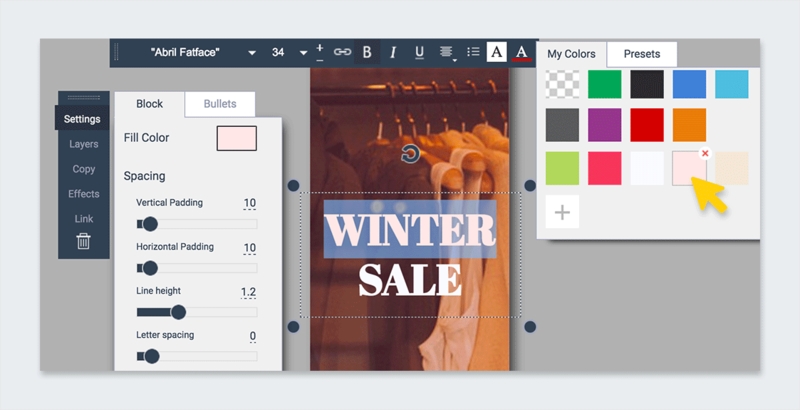 Up until now, Visme has been the go-to software for communicators looking to easily create interactive and animated infographics, presentations and charts. 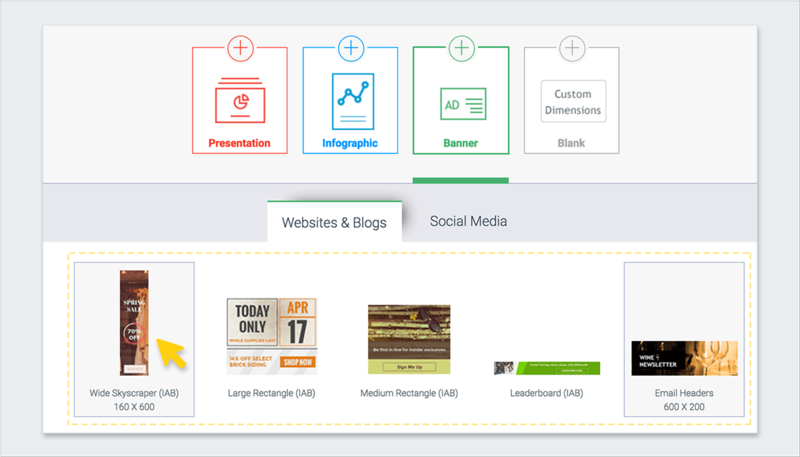 Now, Visme users can also create social media graphics and banner ads in a few minutes with its ready-to-use templates. In this short step-by-step tutorial, we'll show you how you can easily and quickly customize any of these with your own information. If you haven't already taken Visme for trial run, you can sign up with just your name and email at www.visme.co. Next, you'll be prompted to give a name to your project and then choose the type of content you want to create. In this case, you can choose the Banner option and then click on the Social Media tab to browse through the different ready-to-use templates. All of these images are already sized according to the dimensions required by each of the major social media platforms: Facebook, Twitter, Google+, YouTube and LinkedIn. 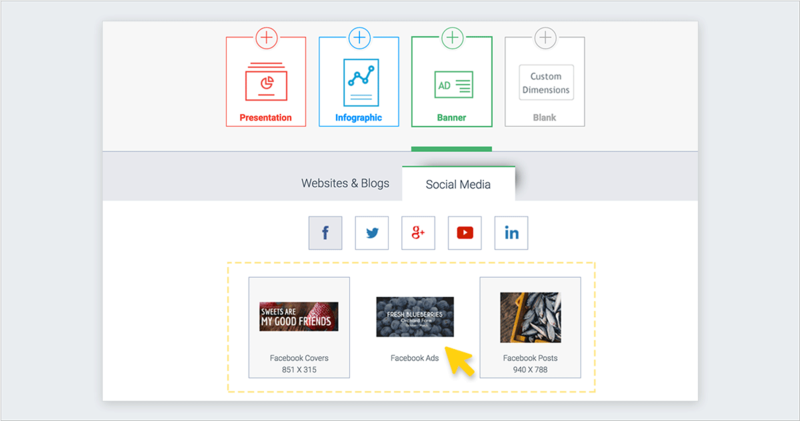 Under each of these options, you'll also find templates categorized according to image types, such as covers, ads or posts. Next, all you have to do to customize a template with your own information is to click on one of the text boxes and type in your text. You can also re-position any of the text boxes by simply moving the cursor over the outer edge of the text box until it becomes a cross and then clicking and dragging the box to the desired location. 3 Apply your own color scheme. You can then apply your own color scheme either to your entire text box or just a single word by selecting it and then clicking on the Text Color icon located on the toolbar at the top of your screen. You can choose any of the colors saved from previous projects under the My Colors tab or select any of the pre-defined color combinations under the Presets tab. 4 Choose from hundreds of fonts. You can fully customize the look of your design by also applying your own font selections. Whether you're looking for a modern, chic look or a bold and impactful style, there are hundreds of fonts to choose from the drop-down menu at the top of your screen. 5 Upload to social media. Once your project looks exactly the way you want it to, you can then upload it directly to the social media platform, in this case Facebook. Since the templates are already sized according to the image requirements set by each channel, you don't have to resize or crop any of them, simply upload and save. From edgy and provocative designs to calm and soothing ones, there's something for everyone. For example, under Facebook covers, you can find high-flying scenes like these that evoke a sense of freedom and limitlessness--perfect for any Facebook profile that is looking to inspire viewers and fans. Since every image is already sized according to the image specifications required by a specific social media network, all you have to do is customize it with your own information, upload it to the platform, and you're good to go. Then, under the Facebook ads category, you can also find many options that already come with text overlays that can be customized with your own information. 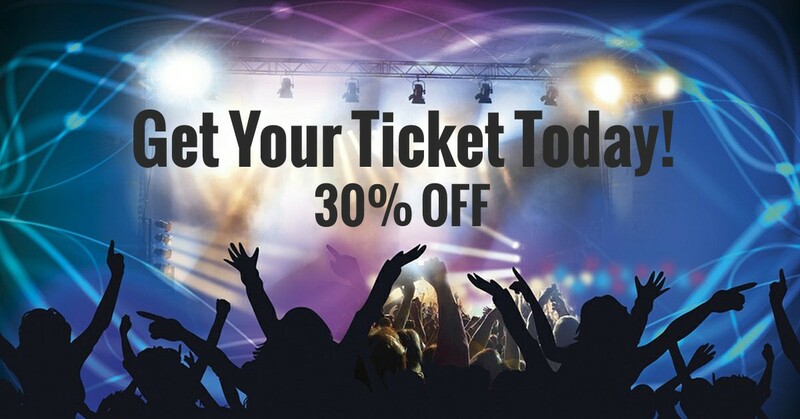 For instance, if you're looking to promote an event or concert, there's this template with a large call to action and a discount offer that can give you a good starting point for your own Facebook ad. If you're looking for an image for a Facebook post (posts with images receive 2.3 times more engagement than those without), you can browse through Visme's varied selection of templates, which include images related to cuisine, fashion, wildlife, travel, sports, design and nonprofit causes, like the one below. Now, for those who would like to spice up their Twitter profile with an attractive and spacious cover photo, you can also browse through the Twitter header category. There, you'll find a variety of templates for almost every need, including images related to education, extreme sports, food products, travel, marketing, design, music and services like tutoring and classes. As with Facebook posts, tweets with photos get 313% more engagement. If you're hard-pressed to find just the right image for your post and don't have the time to create it from scratch, you can browse through Visme's selection of eye-catching images. 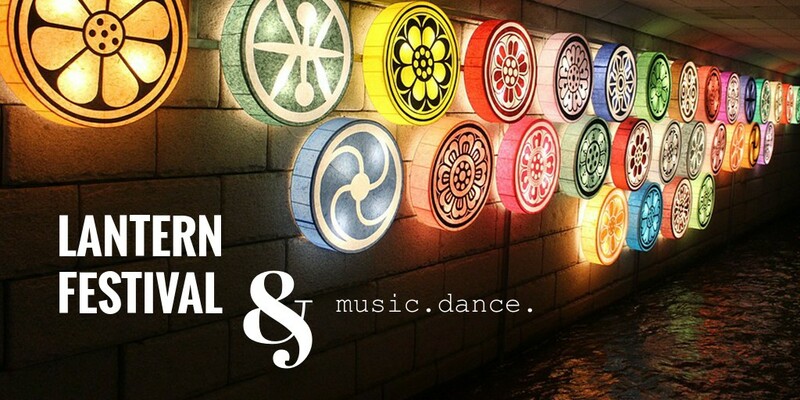 Like the other categories, you'll find everything from travel-related images to beautiful seasonal photos and colorful event ads like the one below. If you have your own YouTube channel, you'd probably like to make the most of your Channel Art and covers to captivate first-time visitors and entice them to stay. One way you can do that is through spacious and modern-looking images that evoke the values and sensations associated with your brand. 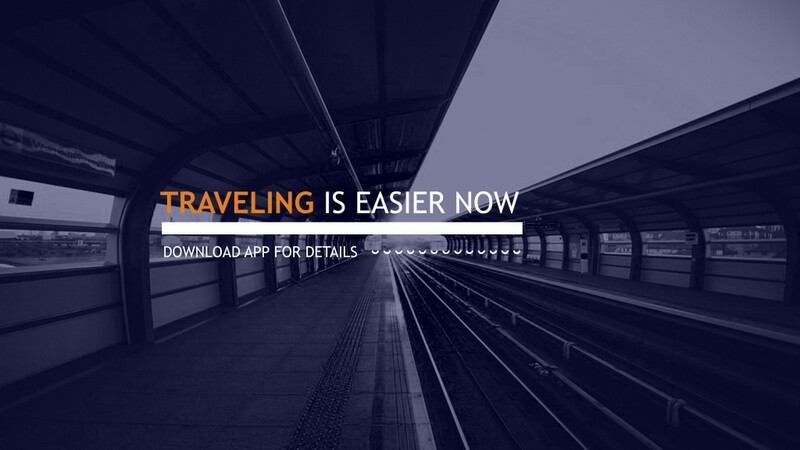 For example, there's a wide selection to choose from, including images related to fine dining, sports, startups, travel, nature and a variety of services and products, such as the app advertised below. Besides social media graphics, you can also now create all types of banner ads in Visme, starting from the dozens of templates already provided for you under the Websites & Blogs tab, as seen above. To start, simply create a new project and choose Banner from the different content options. Here, you'll see five banner types to choose from, all sized according to the dimensions established by the IAB display advertising guidelines: wide skyscraper, large rectangle, medium rectangle, leaderboard and email headers. As with the social media category, you'll find a broad selection of templates to choose from, including ads for food products, apps, design, nonprofit causes, online businesses, among others. 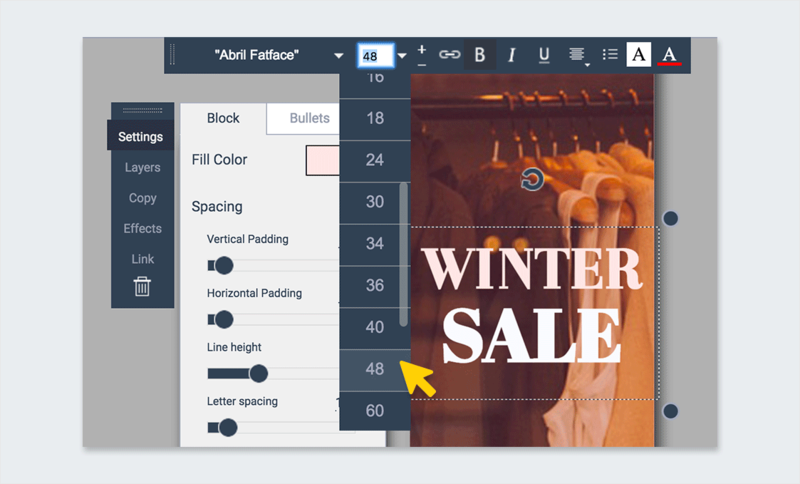 Once you've selected the template of your choice and you're within the Visme editor, all you have to do to customize it with your own information is to click on any of the text boxes and start typing. You'll also notice that a pop-menu will appear with different options for formatting your text so it looks exactly the way you want. For example, you can adjust the spacing between letters and between lines, and you can modify the padding (which is the space surrounding the text within the box). This comes in handy when you want to choose a fill color for your text box, which may be useful when you're looking to create an interactive button or simply want to frame your central message with a specific color so it stands out from the background. Next, you can also apply your own color scheme to the text by selecting the text box (or the specific word within the text box you want to modify) and then clicking on the Text Color icon found on the toolbar at the top of your screen. Here, you can select any of the colors previously used under the My Colors tab or choose from any of the 50 predefined color combinations found under the Presets tab. 4 Adjust the size of the text. 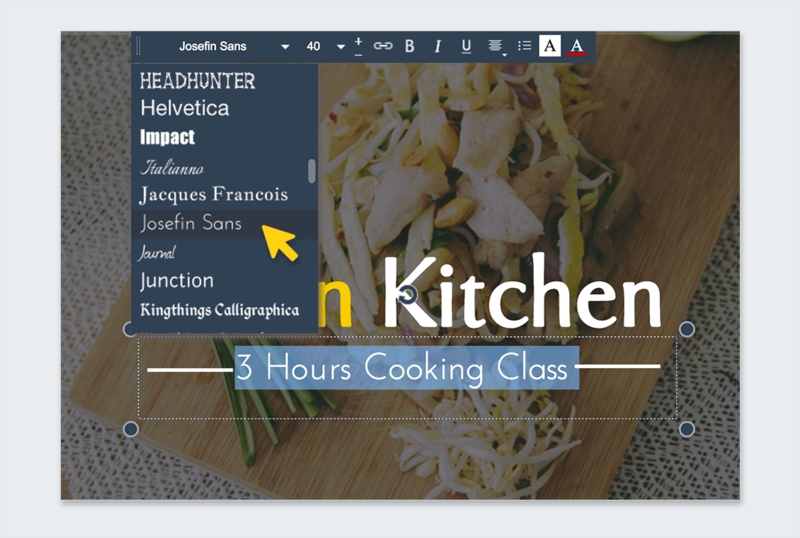 Since everything is customizable within Visme, you can choose any text box and adjust the size by clicking on the drop-down menu found on the toolbar at the top of your screen, or you can also select your own font by choosing from hundreds of typefaces available for you within the editor. 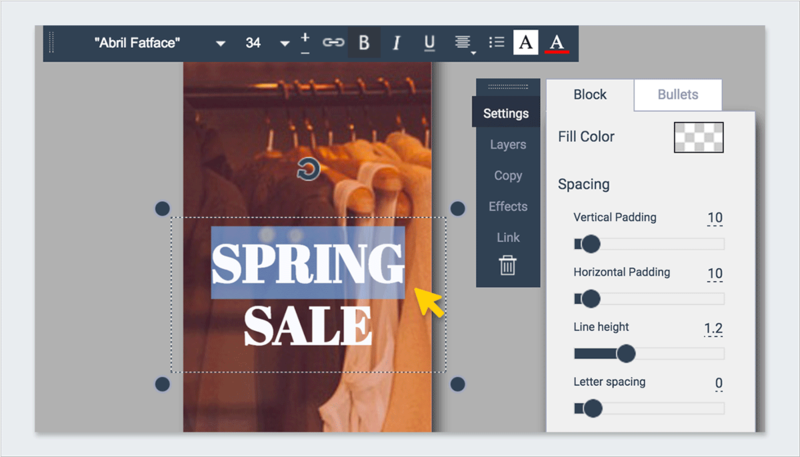 As with the social media graphics, you can move any text box by simply moving the cursor over the outer edge of the text box until it turns into a cross and then clicking and dragging to move the box to the desired location. In case you're curious to see what kind of images are available within Visme, you can find email headers of all types. Whether you own a restaurant and need an image for your email newsletter or have an online clothing store and want to promote a giveaway, you can find graphics for almost every need. You can also find leaderboards for your site or blog, which range from those with a minimalist and colorful style to those with energetic and in-your-face messaging. 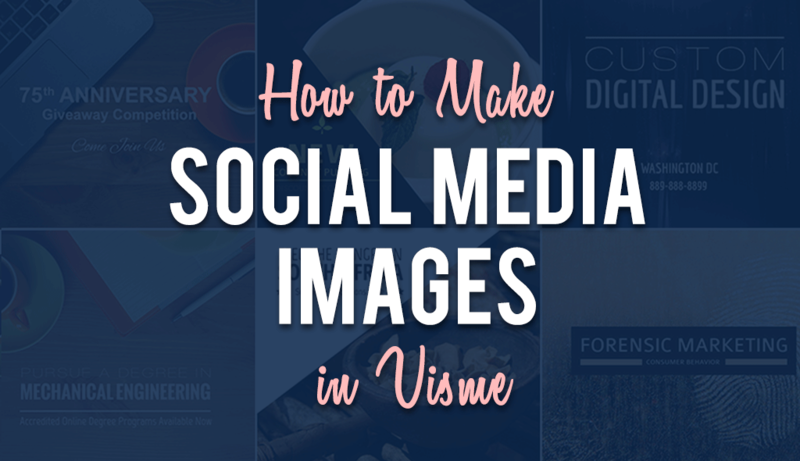 In the next months, we'll be rolling out even more options for other social media channels such as Pinterest, so stay tuned for more tips and hacks on how you can get the most out of Visme's visual creation capabilities. Finally, if you would like to share your projects or visuals with us, don't hesitate to contact us or drop us a line in the comments section below, and we'll get back to you as soon as possible. Thanks, Lexi. Glad you found it useful. How do use the infographic templates and resize them for Twitter posts? As they are, the dimensions are too large for Twitter.